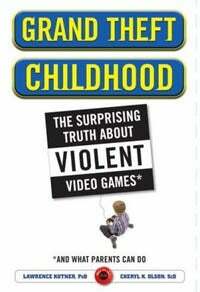 Doubtless you've by now heard of the book entitled Grand Theft Childhood: The Surprising Truth About Video Games, yes? It surely sounds like the kind of novel you all would want to get up in arms about, but relax, the authors, Lawrence Kutner and Cheryl Olson, found that violent games don't make kids psychopaths, but merely allow them to experiment with dangerous behavior in a context that can be healthful (a position I myself tend to take in my editorials). Violent video games are not the only risk factor for aggression, or even the most important factor, but they are definitely not a trivial factor. Parents should carefully monitor what video games their children play this summer, instead of being lulled into a false sense of security about the effects these games can have now and well into the future. Dr. Bushman's statement that video games directly reward violence is only partly accurate; anyone who actually plays video games knows that players are not always rewarded for acting violently, and in fact are often penalized immediately or later on (even in parts of Grand Theft Auto IV). The content and consequences in video games are extremely varied, which is one reason that studying their influence is so difficult. Finally, regarding his experimental study of Dutch teenagers playing a game for 20 minutes in a lab: Those teens are fully aware that no researcher will allow them to act in a way that causes permanent physical harm to someone. Dr. Bushman may be a bit too credulous – a view that is supported by a quote from that Surgeon General's report. It's interesting to hear both sides of the argument, and heartening to hear that the authors are willing to publicly defend their findings even though they're controversial.